What do we love even more than shoes? Affordable designer shoes, that's what. And there's one particular brand that has piqued our interest lately: Sam Edelman. It's the most affordable shoe brand on Net-a-Porter—and we've heard from our inside sources that it sells like crazy, particularly each autumn/winter season when their fashion-forward ankle boots come to save the day. If you aren't clued up on Sam Edelman yet, here's a little info: This is a super-popular shoe brand in America, and it has a major following that includes influencers and A-listers alike. Supermodels such as Gisele Bündchen and Alessandra Ambrosio are keen fans, but it's just as likely you'll spot the Kardashians, Taylor Swift or Selena Gomez in a pair. 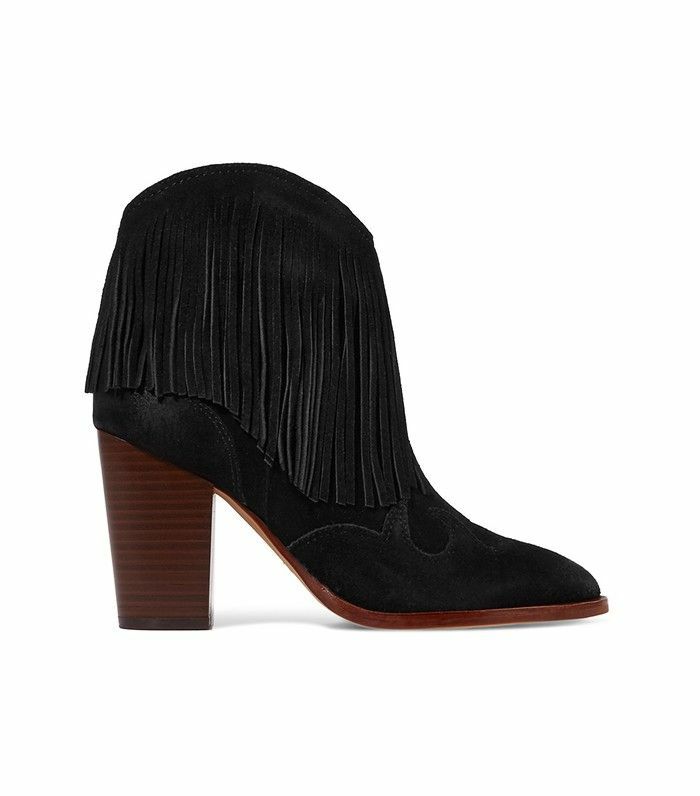 The line specialises in the kind of silhouettes and finishes you'll get plenty of daily wear out of, without looking boring or costing you more than £150; so their black suede cowboy boots have just the right heel height to be employed 24/7, for example. If you've been needing an ankle boot refresh, these are THE ones. Wear with ribbed socks for a granny-chic vibe. These will look so modish with a short skirt. The curved cut on these is so flattering. Subtly tapping into the MAJOR velvet shoe trend. Elaborate boots like these only need a plain outfit. Dancing shoes that don't do damage (to wallets or feet). Find out about the £6 trend Olivia Palermo uses in almost every outfit. Opening Image: Getty Images. Outfit credit: Sam Edelman Yardly Lace-Up Suede Sandals (£120).